Since the musical was announced in 1994, I had been itching to see the musical. Now that I have, I am underwhelmed. With great anticipation and expectation comes great disappointment. And as much as I don’t wish to say I was disappointed with Disney’s Beauty And The Beast, I’d be lying if I said I wasn’t. I didn’t hate it. I just didn’t feel emotionally connected to the characters and the musical. I love the set, the ensemble numbers are wonderfully grand and well translated to the stage, the secondary characters, and the music is still as engaging as before. During the Prologue, the way the set changed just by turning the 3D houses around is quite amazing. And the use of the stairs to demonstrate a change in set is quite clever. I still think that the stage was a little too small and it made the ensemble pieces feel cramped and squished. The limited stage space made the iconic and would have been grand ballroom dance scene seem amateurish and small. I especially loved the way Be Our Guest was translated onto stage. The smart use of sets, costumes and colours really took my breath away. This performance uses a little can can action to remind you that it is actually set in France. Even the music was French music hall inspired. The colourful can can skirts and the use of a foldable screen designed to look like a saucer is really eye catching. There are only 30 cast members but this musical piece made it feel like there were hundreds of them performing in Be Our Guest. Now that is quite an amazing feat. Unlike a film, a musical performance has the opportunity to interact with the audience. And Beauty And The Beast does that quite nicely. The other ensemble piece I surprisingly enjoyed was Gaston. In the animation, I didn’t enjoy this scene because it celebrated and praised the character of Gaston. However, the choreography created for the musical is really fun and impressive. There are 6 new songs in the musical version of Beauty And The Beast and while I am not a fan of all of them, there is one that I really like. If I Can’t Love Her is the Beast’s solo song and when I first heard the tune, it really reminds me of The Phantom Of The Opera. And while I don’t like the story and characters of The Phantom Of The Opera, I love its music and songs. And this song really stuck a chord with me. I think it’s great that the original composer also worked on the musical and created new songs for it. So the songs didn’t feel out of place and flowed quite well with the much loved and well known songs. Now for a musical, it’s isn’t just about the music. The characters must be able to engage with and draw the audience into the story. In the animation, I really connected with the character of Belle and the Beast. However, with the musical, it surprised me that I actually loved the secondary characters like Lefou, Cogsworth, and Lumiere more. 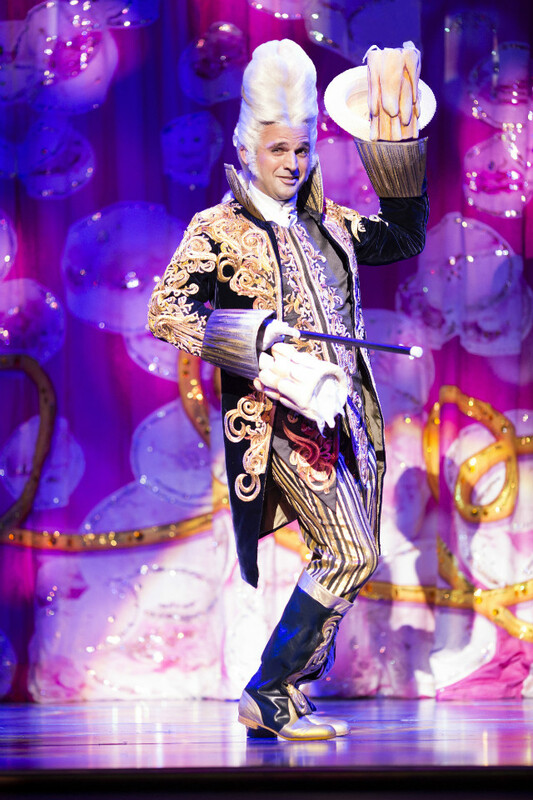 In fact, I think Lumiere totally stole the show. Played by Hassan Nazari-Robati, he was laugh out loud amazing. The Beast is over the top childish. I supposed I wasn’t surprised that Gaston, Lafou, and Babette would exaggerate. This is theatre after all. However, I like that in the animation the character of the Beast was more subtle. He was brooding instead of childish. The Beast stomping on stage kinda made me cringe. And this is probably why I didn’t enjoy the musical as much as I thought I would. Hilary Maiberger’s voice is wonderful. She has a classical Broadway tone to her voice, crisp and clear. I really enjoyed her Belle. However, the Beast’s voice (Darick Pead) I did not like very much. One of the things that I was looking forward to in the musical is the transformation scene. Perhaps I was sitting too far away and that is why I didn’t enjoy the way they did the transformation in the musical. Needless to say, I felt disappointed by the musical. Was it worth going to watch the muscial? Of course! I still think it was a good musical. Turn back time and I’d still choose to go for the musical. Only thing I might have done differently is to sit closer to the stage and paid for a cheaper ticket. The musical is staged in the smaller theatre at Marina Bay Sands so even if you sit a little off center you’re still be able to fully enjoy the musical. I know it probably feels like you shouldn’t go for the musical. Especially since I haven’t been doing a good job of singing its praises. However, Beauty And The Beast is still a spectacular musical that should be seen at least once in your life. If you’re still undecided if you should go watch it, check these clips out then make a decision. But do it fast, it finishes its run tomorrow evening. Ultimately, Beauty And The Beast is a timeless tale that has plenty of great messages. It’s not something you want to miss. Cast aside your expectations, embrace your inner child and enjoy the musical. Are you a fan of Disney’s Beauty And The Beast? If you’ve seen the musical, share with us your experience. Did you like or dislike the same parts I did? Which is your favourite scene?